(CNN) -- The Taj Mahal Hotel in Mumbai, India, had been warned about the possibility of a terrorist attack before a 60-hour rampage began Wednesday, leaving at least 183 people dead, the chairman of the company that owns the hotel said Saturday. 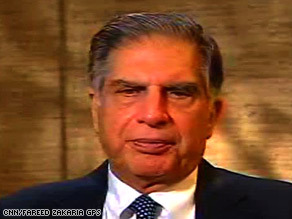 The hotel heightened security as a result, the chairman of the Tata Group and Taj Hotels, Ratan Tata, said in an interview with CNN's Fareed Zakaria. There were indications, though, that the hotel relaxed the security before the attack. "It's ironic that we did have such a warning and we did have some measures," Tata said. "People couldn't park their cars in the portico where you had to go through a metal detector," he said, explaining one of the measures. "But if I look at what we had -- which all of us complained about -- it could not have stopped what took place. They didn't come through that entrance," he said, referring to the entrance that had a metal detector. He did not identify which entrance had the security device. "They came from somewhere in the back. They planned everything," he said of the attackers. "I believe the first thing they did, they shot a sniffer dog and his handler. They went through the kitchen, they knew what they were doing." A. Vaidyanathan, an economist who was a guest in the hotel when the attacks occurred, told The Hindu newspaper on Friday that he had noticed tight security at the Taj Mahal when he stayed there last month -- a measure he indicated was unusual. "The last time I went, last month, there was very tight security. You could not get into the [hotel]. There is an entrance there, which is closed. At the entrance to the tower, they had two-level security," he told the newspaper. "First, when you enter the open parking, where the cars are parked, you had a very heavy metal frame, your baggage was searched. ... At the entrance of the foyer, there was another metal detector and you were personally searched and so on." However, for this latest trip, the hotel did not have the strict security. "This time I noticed it had gone. We could go straight to the [hotel]." The 105-year-old hotel was the site of the attackers' final stand. Authorities carried out a room-by-room sweep in the 565-room Victorian building late Saturday to make sure all guests had been evacuated and no gunmen remained hidden. The hotel's guests and staff had endured about 60 hours of explosions, gunfire and fires during the standoff. Another luxury hotel in Mumbai a few blocks away, the Hotel Oberoi, had also been among the nine sites attacked. "I kept hearing the grenades or explosives going on inside; the sound of gunfire, the fact that there were several hundred people in the hotel, either at dinner or living there, and I just felt tremendously helpless," Tata said. Like several Indian officials, Tata said the attackers were well-equipped and well-versed in his hotel's layout. "There seems to be no doubt that they knew their way around the hotel," he said. "They seemed to know it in the night, or in the daytime. They seemed to have planned their moves quite well, and there seem to have been a lot of pre-planning in terms of what they did and how they managed to carry on for three days and sustain themselves during that time." Asked whether it was possible if some of the attackers had an inside connection, he replied, "I wouldn't know. I think this would be something that the investigation will show up." "The general manager lost his whole family in one of the fires in the building," Tata said. "I went up to him today and he said, 'Sir, we are going to beat this. We are going to build this Taj back into what it was. ... We will not let this event take us down.' "